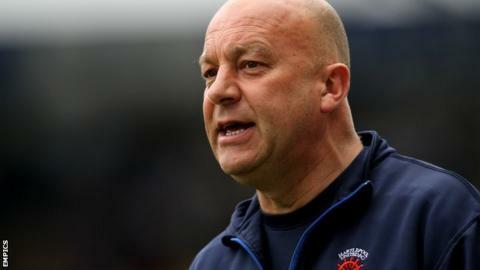 Hartlepool United head coach Neale Cooper has admitted he would not want to play behind his back four after the 3-1 defeat at Colchester on Saturday. Pools, who currently lie 23rd in League One, have conceded more away goals than any other team in the division. "We're just crucifying ourselves at the back," Cooper told BBC Tees. "I felt sorry for [keeper] Scott Flinders. I wouldn't like to play behind that back four just now." He added: "I keep saying certain things but the personnel are not doing it. I'm thinking to myself 'what am I watching here?'" Hartlepool have failed to win away from Victoria Park since March, although they did pick up more points on their travels than on their own ground last term. But having called upon his defenders to start replicating that form last week, Cooper says that individual errors are costing his side dearly. "To gift goals like we did yet again, it's killing us," added Cooper. "Sorry if it hurts, but it's not good enough. Every attack through the middle, the big lad was destroying them. "We have two centre-backs that are experienced for this team, yet it's like they've never played together. Maybe personnel have got to change in that area because it's just not good enough."